1. Soak the dal for 15 minutes and drain well. 3. Fry the saunf for 30 seconds. 4. Add the green chillies, onions, mullangi and salt. 6. Cook for 5 minutes. 7. Add the dal and stir again. 8. After a minute, switch off the flame and remove. 9. Serve with rice or chapati. 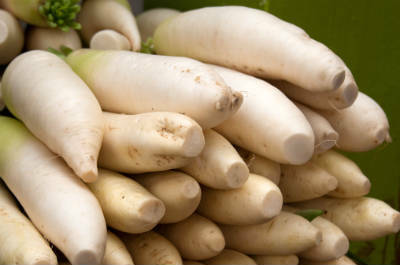 Feel free to comment or share your thoughts on this Mullangi (Radish) Poriyal Recipe from Awesome Cuisine.